Waldorf education epitomizes the concept of natural learning. It views human beings and the natural world as interwoven expressions of spiritual realities, culturing respect and responsibility for the earth, which provides sustenance for us all. The Waldorf philosophy integrates the natural world through everything from outdoor play, to gardening, to bread making, to toy making, to nature stories and of course through the natural toys Waldorf is known for. An often overlooked part of Waldorf’s connection to natural learning is through their celebration of the seasons and seasonal festivals. 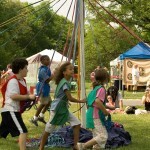 The celebration of festivals is an important part of Waldorf education. A festival is a joyous celebration of life, and has the quality of lifting us out of the ordinary and into the mysteries and magic of the rhythm of the seasons. Throughout history, festivals have emerged from people’s connection with their spiritual life and their search for the meaning of human existence. The celebrations are interwoven with the life of the earth and the cycles of nature. Many faith-based traditions recognize the spiritual realities behind different passages during the year, and that is why special observances cluster together on the calendar. In the Waldorf tradition, festivals are meant to reflect the spiritual reality of what is happening to the earth during important passages during the year. For example, we can experience the autumn in a natural way as we watch the colorful changing of the leaves, feel the crispness in the air, and taste the tartness of a newly picked apple. We can experience it also, in a spiritual way, if we begin to perceive the beauty around us. The awe of a special sunset can quicken a sense of reverence, stir us to voice a few poetic lines, or feel an inner peace. A common experience of joy and reverence is what allows a festival at a particular time of year to unite a whole community. Singing, dancing, stories, food and sharing are all a part of the festivals of the year. The four main seasonal festivals celebrated in the Waldorf tradition are Easter (spring), St. John’s Tide (summer), Michaelmas (fall), and Christmas/Advent Spiral (winter). May Day is also a major celebration. Let us take a brief look at each of these festivals and how they connect children to nature. Easter begins the anthroposophical calendar, with a date that varies each year. This season represents the morning of our earthly experience. The long winter has passed. Nature begins to awaken. The energy of rebirth, transformation, healing, and renewal are finally here! Children experience Nature’s path through the seasons and particularly in the joy of springtime. The tiny buds bursting into flower, the baby birds and animals, the greening grass, all reveal to the child the cycles of life, the breathing in and out of the earth. It is time for dyeing eggs, getting the garden ready for planting, reveling in the mystery of death as a caterpillar and rebirth as a butterfly, and dancing around a May pole. Other feast days in Spring include: Vernal Equinox, May Day (5/1), Whitsun (50 days after Easter), and Passover. St. John’s Tide (June 24th) marks Midsummer in ancient cultures, and also the feast of St. John the Baptist. It is the afternoon of our earthly experience, as we watch the sun reach its high point at this time. It is time to honor the sun, and to pray for good crops. This is a time when all the forces of the earth have grown outward and have spread themselves even beyond the furthest blooming and greening of the plants. It is a time to breathe out, to let go. It is a time when the cosmos brings the spiritual to humankind and, as such, is reflected and revealed to us. Children enjoy activities of an outward and expansive nature. They swim, travel, picnic, walk on the beach, camp, bask in the glow of a bonfire, and attend outdoor festivals, particularly those related to crops like strawberries, blueberries, and corn. St. John’s Day is a fire day! 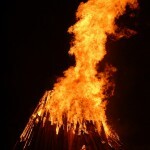 Traditionally a large bonfire is built around which the community dances and sings. Human beings add their voice to the harmonies arising from the fragrance and colors, the pollen and potencies of the plant kingdom, as well as the melodious songs of the birds, the sonorous humming of the bees, and the comfortable lowing of pastured cows. Michaelmas (Sept. 29th) marks the feast of St. Michael. Known as the conqueror of the dragon with his starry sword, Michael gives us strength to slay the dragons of our modern age, such as materialism and egoism. It is the evening of our earthly experience now. The autumn equinox is traditionally a time of mixed feelings, matching the changing of the seasons. In earlier times it was an occasion for gratitude for the harvest’s bounty but also a time of concern about the more challenging days ahead. As the days grew shorter and Summer ceded to Fall it was a time to look inward and find one’s own strength and courage, as opposed to the outward push of spring. It is a time for children to harvest what was sown in the spring and what grew all summer. The earth draws its energy inwards, and so do children. 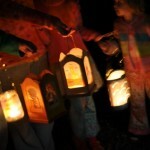 A lantern walk is the main component of the Michaelmas festival. Christmas (Dec. 25th) is an ancient festival. It is the night of our earthly experience. This festival is celebrated when the sun sends the least power to the earth. 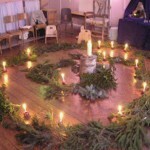 The Advent Spiral takes place on the first day of Advent, the fourth Sunday preceding Christmas. The days are short, the nights are long and this festival helps remind children of their ability to bring their own light into darker times. A spiral of greenery is laid out on the floor of a quiet, darkened room and filled with items representing three kingdoms: plant, mineral, and animal (man being the fourth). At the center a lit candle is placed, and each child is given a turn to make his or her way through the spiral to the center, carrying an unlit candle they have made in preparation for this day. When the center candle is reached the children light their own candle off of the central candle and then place it somewhere along the spiral as they make their way back out. As the children place their candle along the path the light in the room slowly grows. It is a quiet and moving experience, both to participate in and to watch. Other feast days during Winter include: St. Barbara (12/4), St. Nicholas (12/6), Hanukkah, Winter Solstice, Candlemas (2/2), and Valentine’s Day (2/14). Seasonal festivals are a powerful, rhythmic force in connecting children to nature in a predictable way. Even if you do not subscribe to the Waldorf philosophy, celebrating the seasons is still a wonderful way to connect your entire family to the wonders of nature. 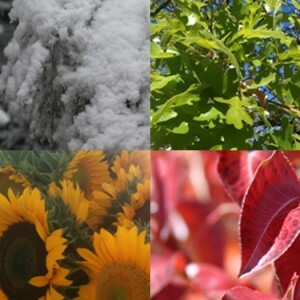 Give some thought to how you might be able to usher in each season and help your child explore his or her connection to nature further. How cool! I especially love how they can all be tied to Christian holidays/saints days if you’re inclined to do so. I had heard of Michaelmas before but had never read anything about it. I might have to do something fun for it in the future now! I adore this post! I may be Waldorf and not even know it! I had no idea this approach had a label! Beautiful!